Although SONY is the major audio device manufacturer in the world portable headphone amplifier is something new for them. They’ve lost a lot of esteem in recent years, and struggled as a company to find their identity. So this Sony portable device came back someway had a little bit of that old Sony feeling. Last year Sony launched its first portable headphone amp PHA-1 and had been proven a very successful gadget for nearly every respect. This little device does a great job not only a headphone amplifier but also a DAC with decent amount of outstanding features. Now they bring us an upgraded model PHA-2. Like its cousin Sony PHA-2 still has the best design and function; It is compatible with iPhone, iPod, CD-players and walkmans. It can also work as an external USB soundcard along with PC or iMac. Every little point that Sony implemented on these amplifiers is really just wonderful. In terms of design Sony PHA series is preferable to any of its competitors such as Fostex HP-P1 and V-Moda Vamp. 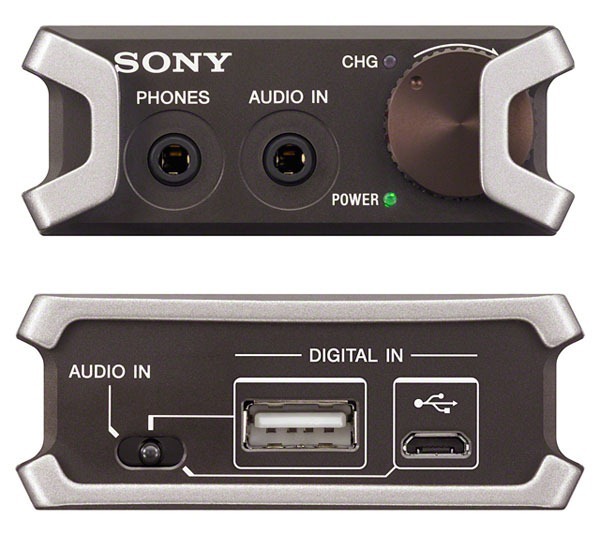 Sony pretty much makes perfection for almost everywhere: the whole case is made of durable aluminum of long lasting black color, two symmetric zinc alloy cast bumpers to protect the volume control and LOD line plugged in from external interference. For further ergonomic and convenient aim a unique rubber clasp system is utilized by Sony instead of the traditional rubber bands for this portable headphone amp. That is a coolest and practical component for providing a much more easier and reliable way to band your source device with Sony PHA-1 and PHA-2. You just put the strip over the DAP and lock the strip in the other side of the portable headphone amp then they are bound nicely together. In addition from that it also has rubber strips along the edge of the case to prevent rubbing of the DAP smooth surface or the table placed. These unit performs well for it has much more power to drive your headphones especially hi-end level headphones. The audio quality shows an obvious difference between iphone 5/5S and the sound through amplifier. It sounds more full detailed, more powerful and the soundstage will instantly open up and the overall dynamic range sonically improves. Then let’s talk about its DAC, which is asynchronous and can operates at 24bit/96kHz based on a Wolfson WM8740 chip, The PHA-1 performs well with my iMac, the sound is more laid back, and instruments are further away than that with the previous iBasso amp. 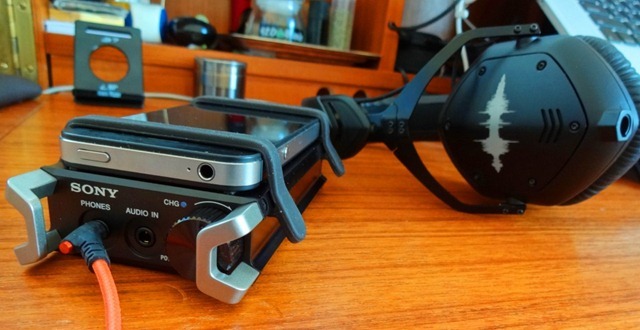 I was using compares to the V-MODA VERZA due to the digital amp and it shows. They sounded almost identical to each other in the same volume with my V-MODA M-100 during A/B testing. Its has a fairly balanced 3 dimensional with more width in particular and of course expanded separation as a result. You can think that the vocals are just a little more distant and mixed unnoticeably into the background. A high quality 96 kHz/24 bit Wolfson WM8740 chip is chosen to do perform the digital-to-analog converter(DAC) while a Texas Instrument high fidelity audio amplifier TPA6120 is built into PHA-1 to give high slew rate. It supports headphone impedances of 8 ohms to 600 ohms, so it should drive just about any headphones on the market. Power is provided by a rechargeable 3.7V 1200mAh Lithium-Ion with respectable battery life. For the analog mode the battery can work up to 8 hours; when switched into DAC mode with an idevice four or probably five hours can be obtained.That is enough for a domestic trip but not as long enough for an international fly from east coast to Asia. So you better come with an extra portable Backup Battery. Fully recharging PHA portable amp requires 4.5 hours. Like any other suitable amplifier Sony PHA-1 provide you a high/low gain switcher to adapt to headphone with different impedance. The PHA-1 was already a pretty great portable headphone amplifier. 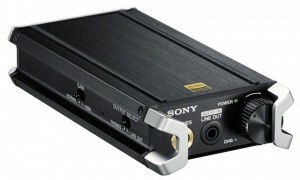 As the first Sony headphone amp it is not fair to criticize it for not perfect. Compared with PHA-1, The new model makes up 2 little faults: Having the line out option and true high resolution digital output for PCM 192kHz/24 bit. DSD 2.8/5.6MHz. The price of the PHA-1 has dropped quite a bit recently. In fact as a partial hype for PHA-2, there is a significant discount for this wonderful portable amplifier that means it can be gotten around $330-350. The PHA-1 is a great amp that offers a lot of versatility with terrific sound. If you want to move up from FiiOs or some similarities to a better all-in-one DAC/AMP solution for less than $400. That is the most valuable and affordable one than many of the other products that fit a similar niche. With the likes of the Fostex HP-P1 with MSRP of 650 dollars and the Hifi M8 being well regarded for 700 dollars, I do not see much competition for the PHA-1 at this price. Nevertheless, now cut the price of the PHA-1 in half, and suddenly you have a deal that can be ignored. If the high end sound quality is the only thing matters to you, then PHA-2 is definitely the right choice for you. You need comment your question first! i am partially deaf,and since the 1990’s headphones and or the appliances such as tv’s computers and listening devices like the ipod/and more recently mobile phones have become so quiet i have had to stop listening to music,just one question,which seems to be obvious but not answered,does it make the headphones significantly LOUDER? ?